Under the Local Government Act 1858, which replaced the Public Health Act 1848, a Local Board (of Health) for the District of Ivybridge was created in the early 1870s. It became the main body for local administration tasked with providing a clean water supply and good sanitation for Ivybridge. 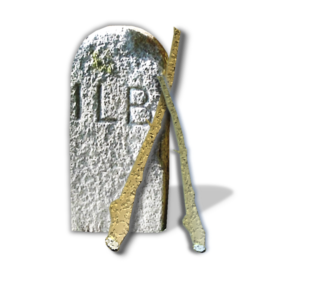 One of their first priorities was to place boundary stones, bearing the letters ILB (Ivybridge Local Board), to mark out their area of jurisdiction. There are ten boundary stone locations around Ivybridge. Whilst the sites are known, some of the stones themselves are missing and assumed lost, following redevelopment. On a brighter note however, our group successfully coordinated the retrieval of the boundary stone from the river at Erme Playing Fields. Reported missing back in 1996, it was reinstated close to its original position on 31st August 2016. Also in 2016 Ivybridge Heritage & Archives Group coordinated restoration work on two other boundary stones on Exeter Road, cleaning and raising them up to their original state, whilst the historic milestone received a fresh coat of white paint. The location of the first boundary stone is at Longtimber Woods between the lower path and the River Erme. It is just prior to the Council Notice Board, near Hunter’s Path. The second boundary stone was reported missing in 1996 but is now located on top of the bank, deep in the undergrowth. At the junction of Kennel Lane (the footpath) and Blachford Road the third boundary stone can clearly be seen on the roadside. 4. Cornwood Road – opposite the western boundary of Hannahs and probably lost due to roadworks. 4.1. Woodland Road – opposite Kennel Lane but not visible. 4.2. Westlake Lane – adjacent to the entrance to the Garden Centre at Endsleigh. This stone is currently not visible and may be lost. “History raised from depths” was the headline in the local newspaper following the successful retrieval and reinstatement of a boundary stone at Erme Playing Fields. The boundary stone was reported missing in 1996. It was for many years considered lost, until a member of our group located it, some 120 feet downstream of its original location. The sixth location is on Ermington Road, just south of the entrance to the playing field and tennis courts. It is assumed that this stone is now lost. The seventh location is on Godwell Lane – adjacent to the stream between the A38 embankment and the veterinary surgery. This stone maybe have been lost during the construction of the A38. Godwell Lane is also the location of the eighth boundary stone. It is partially let into the stone bank on the east of the lane. Located on Exeter Road are the last two boundary stones. One is alongside the wall of Rue St Pierre, whilst the second is located a little further down the road towards the town. Both of these boundary stones were successfully lifted and cleaned on 16th August 2016 by DCC Ivybridge Neighbourhood Team. is an old custom of walking around the parish boundary. The ceremony dates back hundreds of years, from a time when ecclesiastical parishes set different taxation rates and it could make a lot of difference which parish you lived in. Participants would carry long sticks to hit the ground and the boundary markers along the way. In 1992, the Community Council of Devon sent out a challenge to all the inhabitants of the county to do something of lasting benefit to the community, in celebration of the 40th year of the Queen’s reign. Tom Maddock, an historian and previous mayor of Ivybridge, decided to take up the challenge and introduce some ceremonial structure without incurring too much expense. On 6th June 1992 many people in the village gathered in Victoria Park and joined in the jollity of ‘Beating the Bounds’ of the old parish. Starting at the old Ivy Bridge the route led up Station Road, through Longtimber Woods, and then around the boundary of Ivybridge returning to the bridge with a walk down Exeter Road, a trek of some 5.7 miles. This first event was followed by games and refreshments in Victoria Park after the two hour walk. 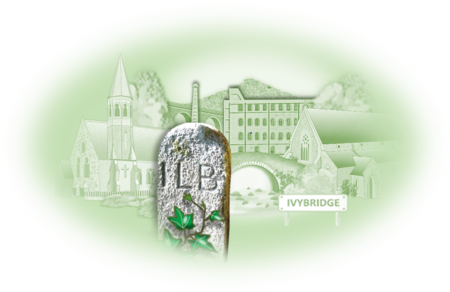 The venture was extremely successful and an ancient historical custom had been established for Ivybridge. There were 3 stones sited in this fourth area, the first is on Cornwood Road, opposite the western boundary of Hannahs and probably lost due to roadworks. The second is on Woodland Road, opposite Kennel Lane but not visible. and the third, on Westlake Lane, adjacent to the entrance to the Garden Centre at Endsleigh. This latter stone is currently not visible and may be lost. The boundary stone was reported missing in 1996. It was for many years considered lost, until a member of our group located it, some 120 feet downstream of its original location. After its successful retrieval it was re-instated on Wednesday August 31st 2016. The seventh location is on Godwell Lane adjacent to the stream between the A38 embankment and the veterinary surgery. This stone maybe have been lost during the construction of the A38. “Beating the Bounds”, is an old custom of walking around the parish boundary. The ceremony dates back hundreds of years, from a time when ecclesiastical parishes set different taxation rates and it could make a lot of difference which parish you lived in. Participants would carry long sticks to hit the ground and the boundary markers along the way.